The whole thing started with this BuzzFeed article titled “40 Amazing Grilled Cheese Sandwich Recipes.” I clicked on it at work at something like 10:22am, knowing full well what I was getting into. Breakfast had faded to a distant memory at that point, but lunch was just out of reach – that is if I was going to exercise reasonable food consumption that day, which was my (original) intention. The first grilled cheese on the list is Grilled Mac N Cheese with BBQ Pulled Pork, accompanied by a mouth-watering photo. The second is Bartlett Pear Grilled Cheese, and the equally crave-inducing photo shows melty cheese clinging to bread and slices of pear. The third featured jalapeno slices and cream cheese. That did it. I suddenly became acutely aware of the depth of hunger I was feeling. I started scrolling through the remaining 37 (37!) grilled cheese recipes with a fervor that would only have been appropriate if my computer was going to self-destruct in a matter of seconds. The photos of oozy cheesy goodness filled the screen. Apple Cinnamon Swirl Grilled Cheese. Garlic Confit and Baby Arugula Grilled Cheese (What is confit?! I don’t care!). Grilled Beer and Cheese Sandwich. Grilled Cheese and Fried Egg. Needless to say, I went home inspired (and starving). I raided my fridge, determined to make my own grilled cheese masterpiece. The green tomato jam I used was (luckily) lying in wait in my freezer. Making it from scratch is a tiny bit involved and it’s best with 24 hours of refrigeration time before use. I put the recipe below because it really is tasty, but I do think you could swap it out for another jam of your choice. If you do experiment, tell me what you did and if it worked! In a medium pot, cook all ingredients on medium-high heat until the tomatoes begin to look translucent. Then slowly bring to a boil for 2-3 minutes or until the mixture thickens. 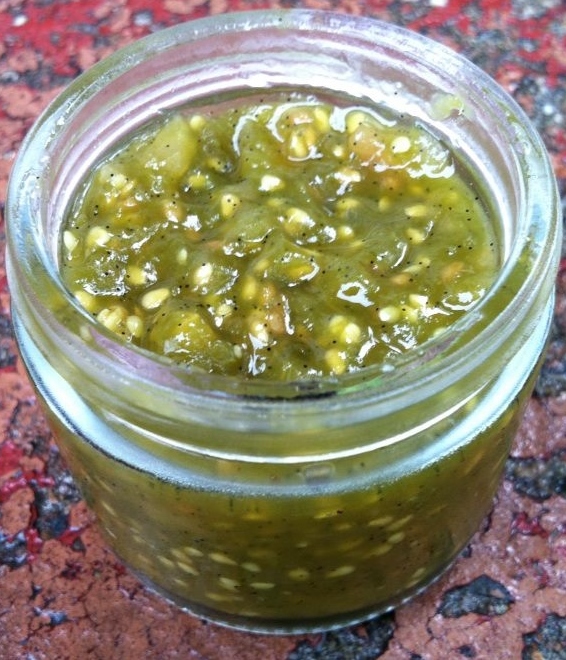 Remove from heat and jar in mason or jelly jars. Refrigerate for 24 hours before use. Spread one side of each slice of bread with butter. Spread a generous layer of jam on one slice of bread. 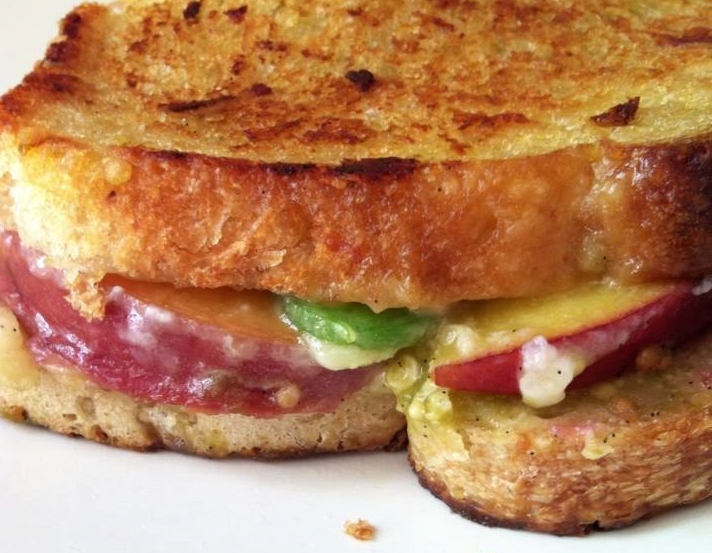 Top with peach slices, jalapeno slices, and brie, in that order. In a small pan, grill SLOWLY (it’s worth the wait!) flipping over every 3 minutes or so until golden brown and melty cheesy. Pro-tip: Dip the corners of any and all grilled cheeses in a tiny bit of spicy dijon mustard with each bite. 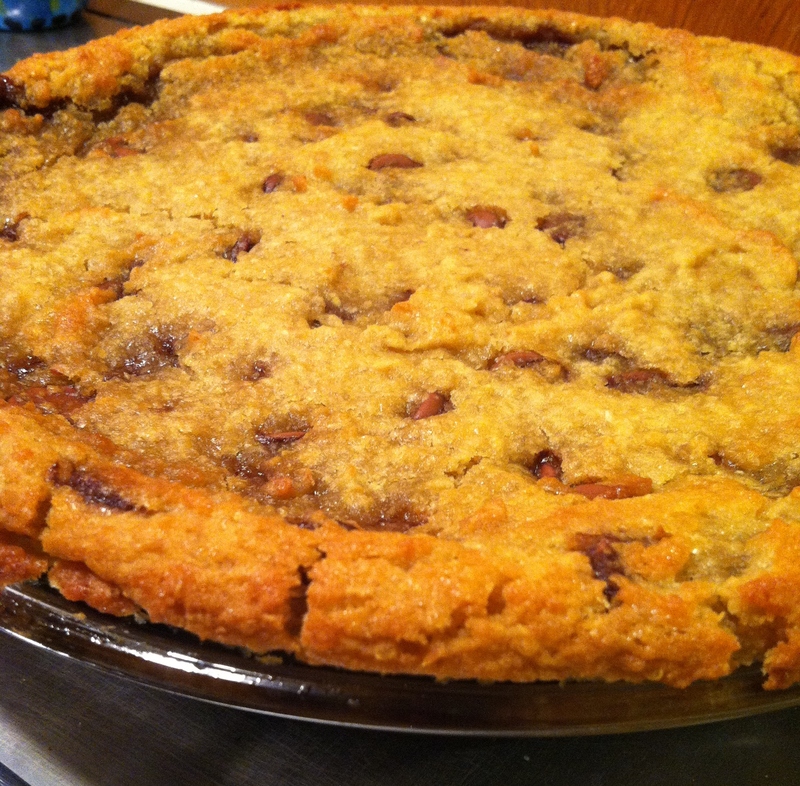 HEALTHY Chocolate Chip Cookie Pie with Quinoa! Thrill, followed by Immediate Doubt, then Guarded Hopefulness, and finally a decision to say screw it and eat it regardless of whether it’s actually healthy (it is) because it looks super tasty and involves chocolate. Well, don’t worry. Thrill was the right reaction (always trust your instincts!). This cookie pie not only is healthy, but it’s gluten free AND one of the ingredients is quinoa – and I always feel like I’m doing the right thing in life whenever I eat quinoa. One small disclaimer is that it will resemble cookie slop if you try to eat it before it has a chance to spend a few hours in the fridge. But I say slop in the nicest way possible and with a little *nudge nudge* *wink wink* to let you know it’s perfectly fine to eat it that way. It improves the taste too, I think, if you’re hunched over the dish shoveling it into your mouth with your bare hands. …Not that I would know. Adapted from Chocolate Covered Katie’s Healthy Deep Dish Cookie Pie. Blend all ingredients except for chocolate chips in a food processor until smooth and cookie dough-like. Mix in chocolate chips. Pour batter into a well-greased pie dish or brownie pan for a square shaped pie. Bake at 350F for 35-40 minutes or until crust begins to brown. Let cool for 10-15 minutes before eating. Refrigerate to really firm up the cookie pie. I do this too, so I’m not being critical, but I love how people ask if you feel differently after you have a birthday. I turned 30 in October, which everyone has informed me is a “big number” (still 2 digits though, people), and the first question I got was if I felt any different. Well, I literally didn’t. 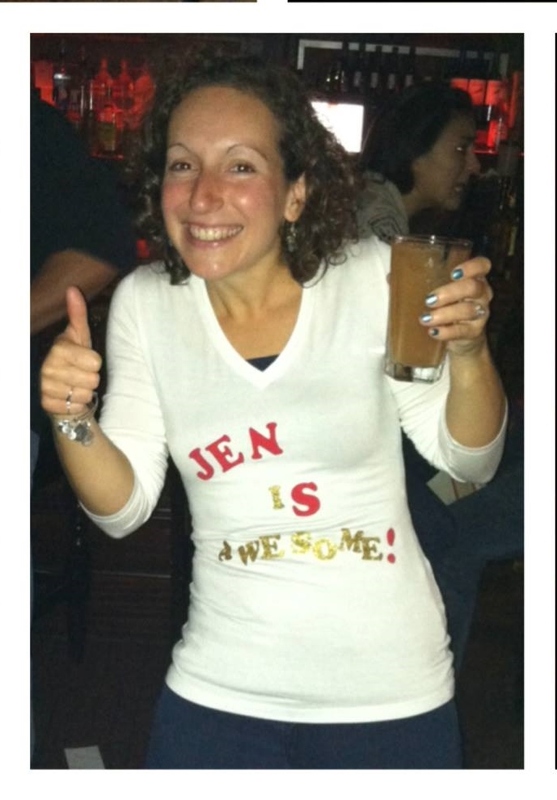 The transition from 29 to 30 was seamless and involved just as much alcohol as any other night that I’ve found an excuse to go out. I had a great time with my friends and was reminded that dancing like a crazy person while others look on in amazement (not awe – that’s something different) is an activity I am committed to for the rest of my life along with other, lesser essentials like eating and sleeping. So I don’t feel different. I feel happy, really. And proud. I’ve lived for 30 years and haven’t managed to significantly ruin anything, which is a pretty long track record considering my relationship with red sauces and light colored clothing. I do, however, have a gnawing sensation similar to teenage angst about the passage of time and fleeting memories and all that, which (in short) led to the birth of this blog. I am a writer after all. What kind of writer doesn’t even keep a journal? David Sedaris, who is hands down one of my all-time favorite authors, writes in his latest book Let’s Explore Diabetes with Owls about how he carries around a notebook at all times to record for inspiration things he sees and hears – sometimes at the expense of enjoying his own life. I’m not really at that level, and also never seem to have a pen handy, but this seems like a good start. So here’s to being 30, and continuing to do everything I did when I was 29. Because, you know. That was basically yesterday.